Black Diamond Park, Southern Colorado’s ‘Jewel of the Rockies” is a master planned gated community located on U.S. Hwy 160, one mile west of the City of Walsenburg and adjacent to the Walsenburg Golf Course and the 1600 acre Lathrop State Park offering extraordinary recreation right at your doorstep. The Black Diamond Park Master Plan includes exclusive features such as attractive and secured gated entrances, boundary privacy walls and fences, walking and bike paths, and a 12-acre park area. Over 60% of all Black Diamond Park estate home sites border some type of open space. Master planned features include all underground utilities such as city water, telephone, power, cable TV and high-speed computer lines to each spectacular Black Diamond Park Master Planned Estate home site. All home sites are have preliminary approval for septic disposal systems and are ready to build now or later. Each spectacular Black Diamond Park estate home site has commanding spectacular mountain views on three sides that include the Spanish Peaks to the south, The Sangre De Cristos to the west and the Wet Mountains to the north with the sun rising every day from the plains located below to the east. Own Black Diamond Park For $99 Down! This development is located just 1 mile west of the city of Walsenburg, Colorado on Highway 160 and borders the Lathrop State Park and Walsenburg golf course. The average elevation is approximately 6,047 feet. Surround yourself with rolling hills, majestic mountains, and fabulous panoramic vistas and great landscape views. All are the perfect setting for the unspoiled foothills of Huerfano County. With every breath of fresh, clean air, you'll know this pristine unspoiled property is for you - especially since it has been thoughtfully master-planned to exist in harmony with nature and wildlife. This scenic property is approximately 1 mile west of Walsenburg, Colorado, 49 miles south of Pueblo, Colorado, and 92 miles south of Colorado Springs, Colorado. All roads are maintained by the developer providing legal access to your property. All of the lots have been surveyed, staked and marked for identification by the developer. Black Diamond Park Plat Map. Most property owners feel that it is a good opportunity to own a nice lot, yet affordable piece of Colorado. The unique proximity of this property to Walsenburg will allow owners to enjoy a country lifestyle while living just minutes away from the amenities a city has to offer. Some owners plan to make their property into a second home, while others plan to move to their property after retirement. Many plan to pass it down to their children or grandchildren, while others plan to possibly subdivide the property at a later date, keeping some acreage and selling the rest. Many of the property owners also plan to utilize the property as a permanent home or a recreational retreat or getaway from the hustle and bustle of the big city. These lots are ready for you to build your dream home or just enjoy the good feeling of land ownership. Water supply is provided by the City of Walsenburg with 8 inch underground water mains. The water system is state of the art and completed, and has been accepted for ownership and maintenance by The City of Walsenburg. Each Black Diamond Park Home site within the subdivision has one 3⁄4 inch water tap installed to the property. There is a one time tap fee, currently $4,000 to the city of Walsenburg, payable at the time of water hook up. Sewage disposal will be by individual on site systems such as septic tanks and leach fields. A specific approval for individual septic disposal systems has been received from the Las Animas – Huerfano Counties Health Department, 119 e 5th Street, Walsenburg, CO 81089. Prior to obtaining a permit you must have a percolation test made on your lot by a person authorized to do so by the district health department. The cost of a permit is $450.00 and includes the percolation test. Compete septic and leach field systems are currently costing approximately $3,500 in the area. The Developer has constructed underground electrical transmission lines at its sole cost and expense to a street boundary corner to all lots within the subdivision without additional charge to the purchaser. Electricity is provided with a $100.00 deposit by San Isabel Electric Association, Inc. PO Box 892, Pueblo, CO 81002. Rates for service are regulated by the Public Utilities Commission of the State of Colorado. Approximate cost to extend underground transmission lines within the lot boundaries is $9.00 per linear foot. Underground telephone service has been extended to one corner of each lot in the subdivision at no further charge to the purchaser. Telephone service is provided to the subdivision by Qwest Communications, 1005 17th Street, Denver, CO 80203. Cost to extend underground telephone transmission lines within the boundaries of each lot is approximately $4.50 per linear foot. Natural Gas is not available in the subdivision. Propane is available from San Isabel Propane Gas Service, 1930 East Street, Trinidad, CO 81089. The zoning is Urban Residential (Single-Family homes). Currently, the approximate annual property taxes calculate to approximately $200 per year and current. 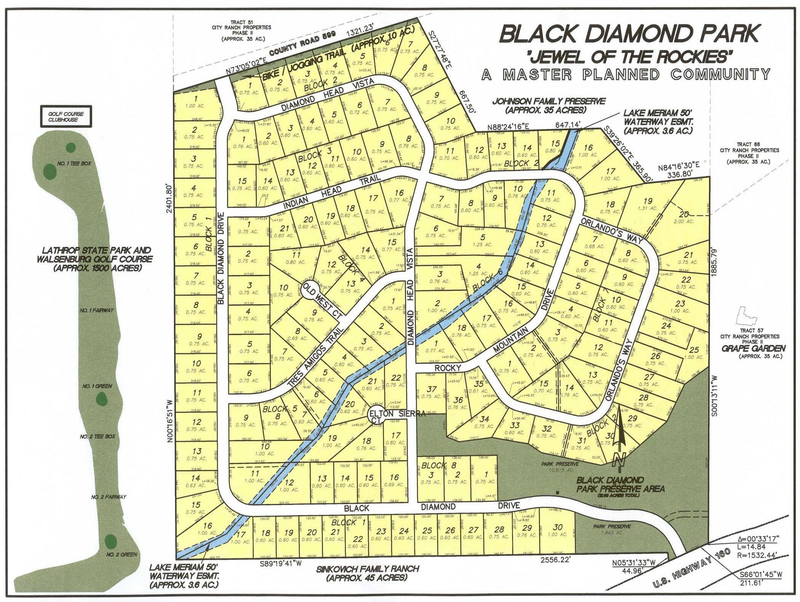 There is no property owners association however the developer has established Black Diamond Covenants.